Timothy Isaiah “Longhair Jim” Courtright (1848-1887) – Born in Sangamon County, Illinois, little is known of Courtright’s early life. He served with the Union army during the Civil War then drifted around until he finally settled in Fort Worth, Texas. While there, he served at various times as a jailer, deputy sheriff, hired killer, private detective, and racketeer. He was the first elected marshal of Fort Worth in 1876 — tasked with keeping the peace in what had become known as Hell’s Half Acre, the town’s wild red-light district. Briefly Courtright left Texas and served as marshal of the flourishing silver mining town of Lake Valley, New Mexico in 1882. 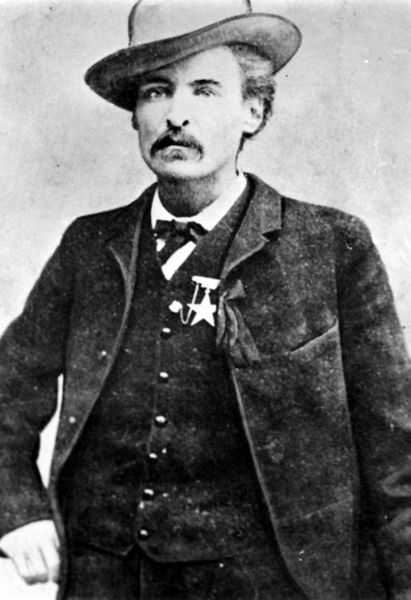 However, in 1883 he was back and was appointed as a deputy U.S. Deputy Marshal, but became a fugitive himself after his posse killed two ranchers. Later, he grew tired of running and turned himself in, though he was acquitted of any wrong doing. By 1887, Courtright was running the T.I.C. Commercial agency in Fort Worth, Texas, which provided “protection” to gambling dens and saloons in return for a portion of their profits. In the meantime, Luke Short, a former friend of Courtright’s, had set up the White Elephant Saloon and Jim was trying to get Short to utilize his services. But the Dodge City gunfighter told Courtright to “go to hell,” he could do any gunslinging that was necessary to take care of his business. Some time later, the two quarreled, resulting in one of the most famous gunfights in western history. With Bat Masterson at Short’s side, Courtright and Luke Short dueled in the street in one of the few face-to-face gunfights in the American West. Shot down by Short, Courtright died on February 8, 1887.